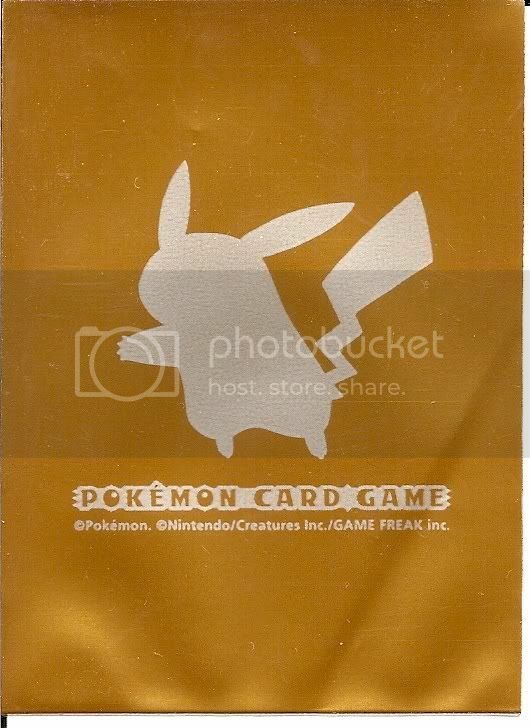 Gold sleeves - Pikachu silhouette PLEASE CLOSE! Discussion in 'Auction & Sales House' started by P_A, Feb 2, 2008. Thanks again for the picture, Mike. what is the starting bid, PA? Taking offers in excess of $100. In other words ... go big or stay home. Offers start at $100 in dollar increments. Was that a taken back bid Jason? Naughty, naughty. I decided to retract my bid, P_A and dont call me naughty, naughty as you see i dont see a rule that no retracts... Did I forgot that you dont accept Paypal? Sorry, didn't mean anything by that. I was just joking with you, but forgot to add a smilie. To be honest, if a person isn't 100% positive that they want something of mine, I'd rather they retract a bid than take it back later - like when we exchange addresses! However, you are right, I don't do paypal. Do you have a picture??? If you need a picture I will have one for you shortly, I tried to go to my photobucket but it is down for maintenance. Oh, thanks Mike. That would save me scanning them with a scanner I don't currently have the drivers for! How many sleeves are there? 60, 65 or more? I was going to save them and put a decent deck together and use them in a tournament, but I never got around to playing in one - always judging. So they've never even had a card in them. They're quite nice, and quite rare. I just can't see myself keeping them though. Looks like Curtis is going to get some unique sleeves at this rate. Any other bids? I don't mind, just as long as Mike is willing, and you cover any and all costs this transaction might incur for Mike. I won't make him pay for my auction, nor will I put anything up front for it when I am quite happy to get other methods of payment. So you will have to ok with Mike first before this bid can be taken. In any case, shipment will not occur until I get it, so will this really make it any faster? You have to decide. I just realised on my bank account that Im a little low since I cannot go below AU$2500 (that is my Worlds savings) so yeah, i wont be able to pay for another 3 week so im out again. Any more bids? Only a few hours to go! Morning everyone, looks like these are going to Curtis. Thanks for your interest, this can be locked now.